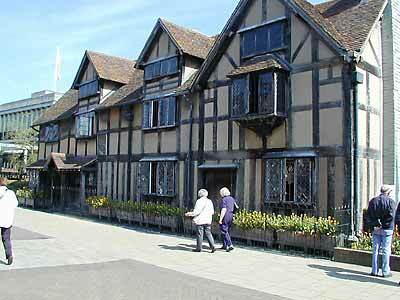 The ancient market town of Stratford-upon-Avon is synonmous with William Shakespeare. There are many more historic facts and figures and just by walking through the town you can discover so much more. Stratford upon Avon is a beautiful town and it is amazing to think that it was set out as a new town in 1196, on a medieval grid system. This is why the streets are straight and why it is easy to find your way around. And even though some of the shops are modern, always look up from time to time and you will find wavy roofs, terracotta dragons on roofs, odd little windows and lots of black and white buildings - painted black and white by the Victorians because they thought it looked neater. And who knows, you may see the spirit of a very young Shakespeare 'creeping like a snail unwillingly to school'. Our thanks go to the Blue Badge Guide who has written this walk, together with its very informative and interesting notes for Quinsolve Limited. 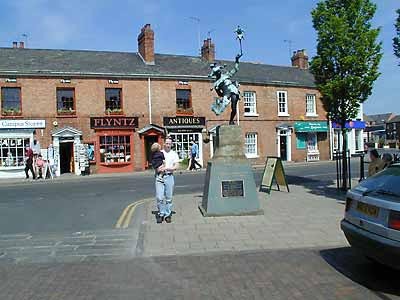 The walk starts at the statue of the Jester in Henley Street, but as this is a circular walk you could actually start your walk at any point, which is why the walk has been split into streets.Follow our walk through town, the time of your walk will depend on how often you stop to browse or shop. Start from jester and look at the lovely innocent smile on the jester's face. Then read the quotations round the base of the statue - these are all taken from Shakespeare and refer to jesters and fools. Read the plate on the front and see why Tony Bird gave the statue to the town. With the jester behind you, walk down Henley Street towards the town. On the left you will see the Shakespeare Centre and then Shakespeare's birthplace. This was originally two houses - as you face the birthplace, the part on the left was the family home where William Shakespeare was born in an upper room in 1564: the building still has the original floor which William ran around on. The part on the right was the workshop and shop where John Shakespeare (William's father) made and sold his gloves. Some of the buildings on the right hand side of Henley Street date from Shakespeare's time, so the street was this wide in the 15th century. Walk on down towards the centre of the town: off to the right you will see Meer Street. This is a curved street, unusual in Stratford upon Avon as most of the streets are straight, but this street followed the line of a stream which ran down from the hills. At the end of Henley Street, on the right hand side, is a white building which is now Barclays, but in the Middle Ages on this spot stood an old Market Hall with open arches to the ground so that people could just walk in and out. The women used to sell their butter and cheese in this market, and it was known as the 'gossips market'. As you stand outside Barclays, in front of you is a flower covered traffic roundabout and this was the site of the market cross and the whipping post. Originally the markets were in churchyards, but when they were driven out of the churchyards into the open spaces of a town, there was always a cross put up, as it was believed that any bargain or sale carried out under the cross would be honest and binding. The whipping post was usually used on market day to bring the people into town. Stratford has had a market for over 800 years but it is no longer held in this part of town. Beyond the roundabout you can see the lovely wide Bridge Street, going down towards the river and the 15th century bridge. 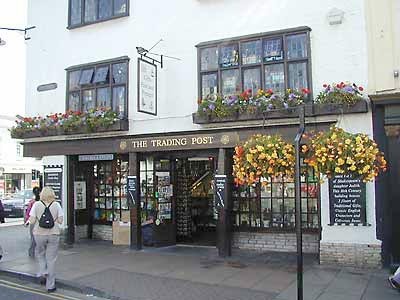 At one time there were market stalls down Bridge Street, then these were replaced by little shops and the two halves of the street were called Fore Street and Back Street. However, the Victorians thought this was cluttered and so took away all the shops and made it into the lovely wide street it is today. Cross the road from Barclays into High Street and on the left hand corner of this street you can see the white painted shop, the Trading Post. This was once a gaol with a cage for prisoners on the outside. Then later it was the home of Judith, Shakespeare's younger daughter. She was married to Thomas Quiney who was a womanising wine merchant who drank more than he sold. Walk along High Street and on the left hand side you will see a large black and white building with a sign outside saying 'Marlowe's Restaurant, newly built 1595' while opposite there is a beautiful carved house with the date of 1596 on it. This is Harvard House, belonging to Harvard University, and there is an inscription on the house saying that it was the home of John Harvard, the founder of Harvard University. Both Harvard House and the black and white building opposite were rebuilt after a very bad fire and it was this fire which made the local authority at the time ban thatched roofs in the town. Just after Harvard House, on the right hand corner, there is a 17th century Pizza Hut and you don't get many of those. On the next corner is the Old Bank, with lovely carved scenes of Shakespeare on and opposite is the Town Hall with the words 'God Save The King' painted on. The King was George III and the Town Hall was built in his reign to replace an old market hall which was filled with guns and ammunition in the English Civil War in the 1640s and then (accidentally?) blown up. 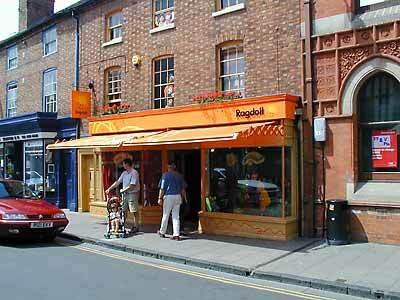 Walking on down Chapel Street, next door to the Old Bank, is Ragdoll, where the Tellytubbies live, together with Rosie and Jim and the characters from Tots TV. All these programmes are made at a secret location just outside Stratford. Opposite Ragdoll is the Shakespeare Hotel. Be very careful if you stay here as all the rooms and suites are named after Shakespeare's plays, and you don't want to spend a romantic holiday in a room called 'Much Ado About Nothing'! Cross over the road towards the Shakespeare Hotel and walk along to the corner. Just before the corner is a lovely three storied black and white building which is Nash's House. Now a town museum, it was once the home of Thomas Nash who married the girl next door, Shakespeare's granddaughter Elizabeth. 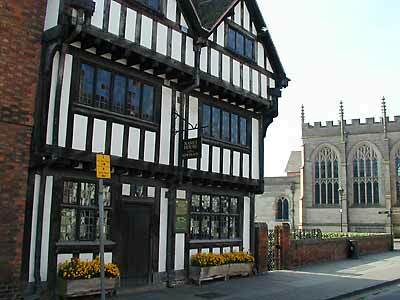 On the corner itself is the site of the house where Shakespeare died on his 52nd birthday in 1616. In the garden is a green plaque which tells you about the house, which was called New Place. Walk across the top of Chapel Lane over to the next corner and there is the Guild Chapel, parts of which date back to the 13th century. Go inside and have a look at the stained glass windows and the very old wall paintings. Once outside again, walk along Church Street and next to the Guild Chapel you will pass the Grammar School which was founded by the Guild of the Holy Cross, based at the Guild Chapel. This is the school which Shakespeare is said to have attended and it is still a boys' Grammar School. Continue past the 16th century almshouses (almshouses were provided by the Guild of the Holy Cross for the poor of the town) and then walk along to the end of the street and turn left into Old Town. 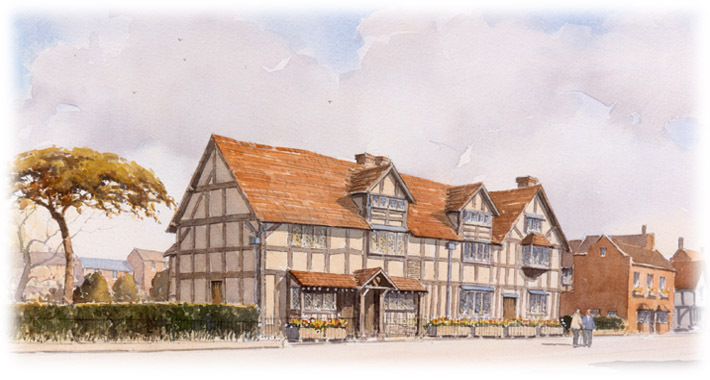 As you turn this corner, look up at the white painted carved wood at the tops of these red brick houses Shortly, on the left hand side, you will come to a beautiful old house which is Hall's Croft, formerly the home of Shakespeare's daughter Susannah and her husband Doctor John Hall. He used to grow the herbs and plants he used for his medicines in the garden behind the house. Walk on past the house, cross Southern Lane, and then follow the road as it curves to the right until you come to Holy Trinity Church. The Church is free to enter (mind the very low door) but there is a charge to see the grave of Shakespeare, who is buried 5 metres below the Church. This is a very unusual Church as it has a weeping chancel - if you walk straight in and stand by the font and look down the central part of the Church you will see that the other end, with the choir stalls, is at a slight angle. This is said to be the angle of Christ's head when he was on the cross. 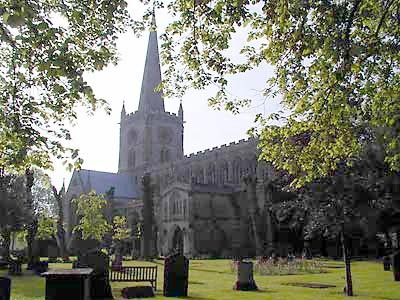 If you do go to see Shakespeare' grave, look at the choir stalls and the very old seats as they are beautiful. The bust of Shakespeare on the left hand wall over the graves of Shakespeare and his family was put there while his widow Anne was still alive and she is said to have said that it did look like him. Come out of the Church and walk back to the corner of Southern Lane and then turn right and walk along this road. On the right hand side there is a brass rubbing centre. Cross over just before the pub The Black Swan, then walk past and look back at the pub sign - it is now called the Dirty Duck. Walk past and on the wall by the footpath there is a sign about John Shakespeare and a house he had there. On the right hand side of the road you can see the curve of the Swan Theatre, almost a theatre in the round, and then the Swan Theatre itself - built on the ruins of the old Shakespeare Memorial Theatre which burnt down in 1926. Next to it is the back of the Royal Shakespeare Theatre which was opened in 1932 and designed by Elizabeth Scott. You can cross the road just before the Swan Theatre and walk along the river past the Swan Theatre and the terrace side of the Royal Shakespeare Theatre, with swans and ducks keeping you company. The river is the Avon, which is an old Celtic word for a river, so Stratford upon Avon means the road crossing the river. 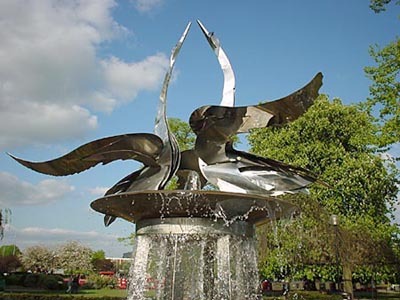 If you stay on the pavement past the back of the Royal Shakespeare Theatre, you will come to the Bancroft Gardens and as you walk past, on your right you will see a fountain with swans on the top. This was switched on by the Queen in 1996 to celebrate 800 years of Stratford upon Avon. Walk to the end of the road, and the water on the right hand side is not the river but the canal basin. 100 years ago this would have been surrounded by warehouses, as Stratford was an Inland port with all the canals used for carrying heavy industrial loads. Now all the canals are used for holidays and the narrow boats moor in the basin for an overnight stop or for a few days. Turn left and walk up busy Bridge Street and at the top of the street cross over High Street into Wood Street (where the wood merchants were). At the end of Wood Street on the left is Rother Market. Rother is Anglo Saxon for cattle with long horns and there are several signs with a long-horned cow above the name of the market. This was where the cattle market used to be, but now it is the site of the weekly market held on a Friday, with a Farmers' market on alternate Saturdays. In Rother Market there is a clock tower, built in the Victorian Gothic style. It was given to the town by an American gentleman, George W. Childs of Philadelphia and this is why, half way up, on two corners there are American eagles and on the other two corners there are English lions. And if you look at the point above each of the clock faces there is a fairy from Midsummer Night's Dream. This clock tower is always known as the American Fountain and it used to have a drinking fountain on: the horse troughs were at one time full of water but now full of flowers. Cross (carefully!) from Rother Market and go towards the White Swan Hotel - this was a small pub in Shakespeare's time. If you are in need of a drink by this time, there is a 14th century wall painting in one of the bars. 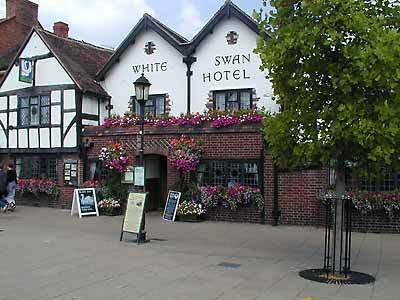 You can then walk along Meer Street (which is to the right as you face The White Swan) and you are back in Henley Street. Turn left and there is the jester in front of you. or similarly if you just to wish to enjoy a meal or a drink in one of the many hostelries in the area then click here for Where to Eat.